I saw this chart in Morgan Stanley's latest Internet trends report. Even though I've been saying for years that social networking will one day usurp email, it's a bit shocking to see that it has. There are some caveats. My kids use Facebook as their primary inbox (they also use gmail). So some of what they do on Facebook is actually email. 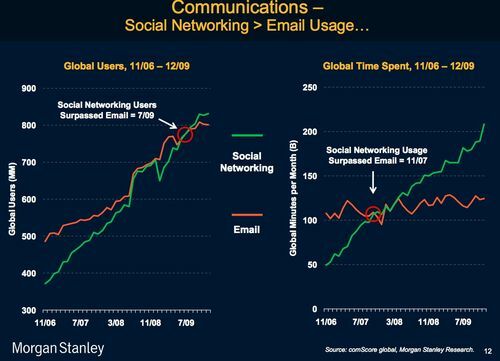 But even so, it looks like email's reign as the king of communication is ending and social networking is now supreme. When we landed back in the states recently after a long flight and got in a car to drive into the city, The Gotham Gal looked at me and said "why are you checking twitter and not email?" (as she was doing). I told her that email required a reply and twitter did not. And that I preferred twitter to email and always checked it first. Whether it's Twitter, Facebook, or some other social networking service, I believe the lighter weight communication paradigm (say less, reach more) is superior to email for many things and I'm certainly moving more of my communications away from email. Ideally, that would leave the more important heavier weight communications in email. If it were only so. Email's biggest problem is the inability to control other's power to email you. That is also its greatest strength. If email can solve the inbound overload problem, it can become a sustainable compliment to social networking and remain a powerful mode of communication for a long time to come. It's a truly private channel and is more suitable for long-form serious private conversations. 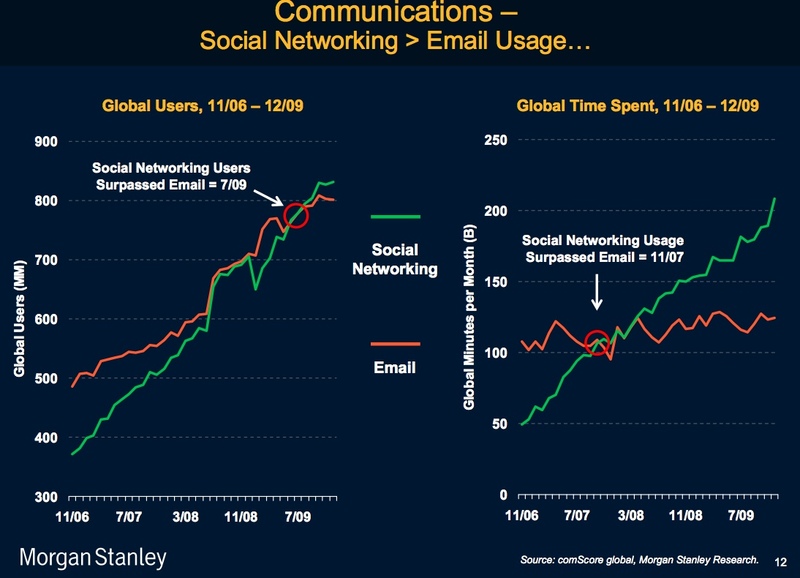 And email's usage is still growing (125bn minutes per month in the chart above). So don't take this post as anti-email. We've got one email related investment that is doing great, Return Path, and we are certainly open to doing more there. But social networking is the king of communications now. Long live the king.